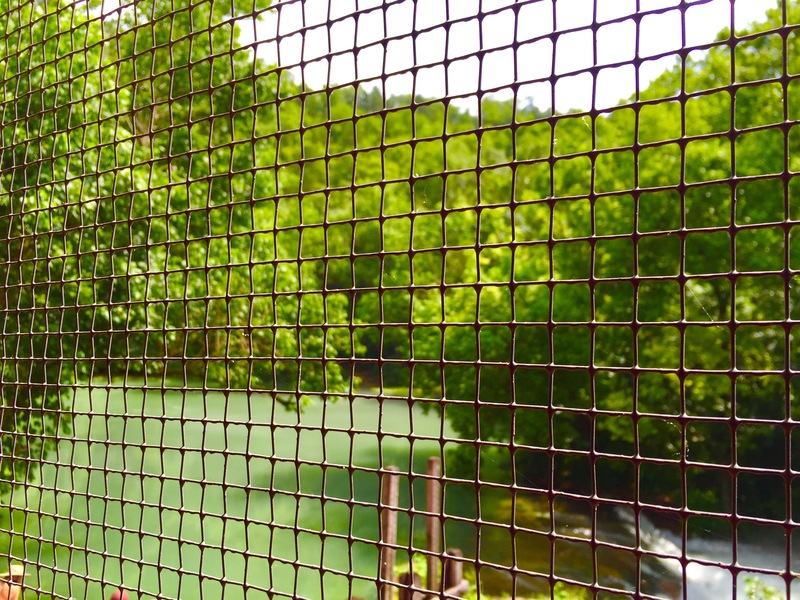 Located deep in the Ozark National Scenic Riverways is the Alley Mill and spring. My friend and I recently planned a trip to do some sightseeing around the Current and Jacks Fork Rivers, but due to flash flooding, we had to cut our trip short. However, we were able to stop and see the mill and spring. 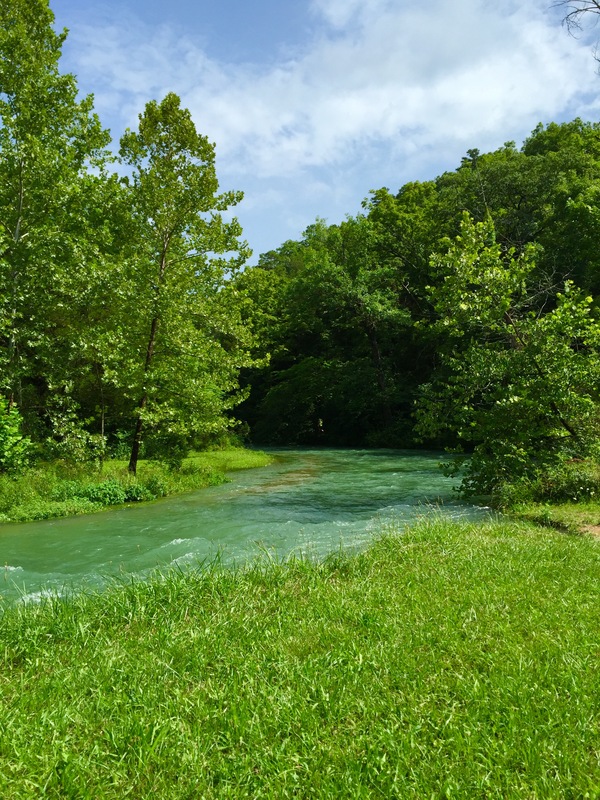 Alley Mill is located 6 miles west of Eminence, Missouri on Highway 106 which is about three hours southwest of St. Louis. The first thing you notice is how the bright, red mill contrasts with the green of the grass and the blue of the spring. 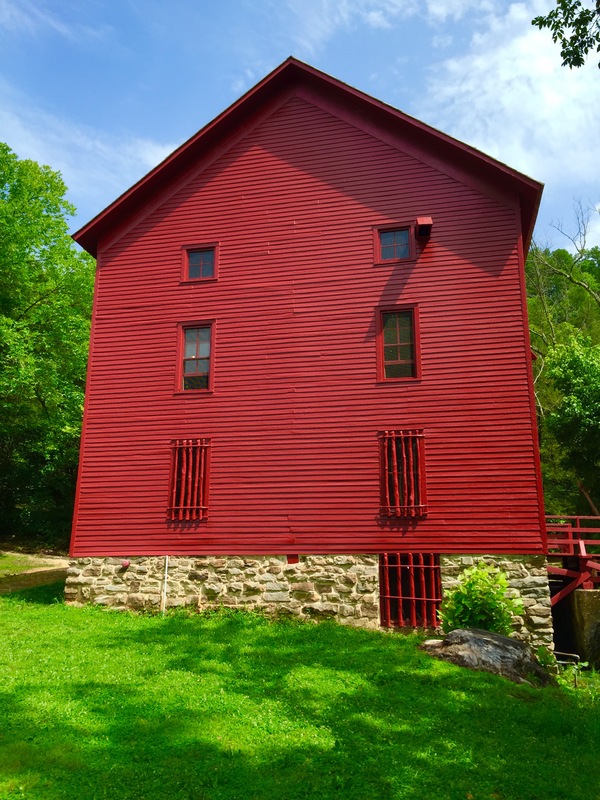 The mill that we see today was constructed in 1893. It was originally painted white with green trim. 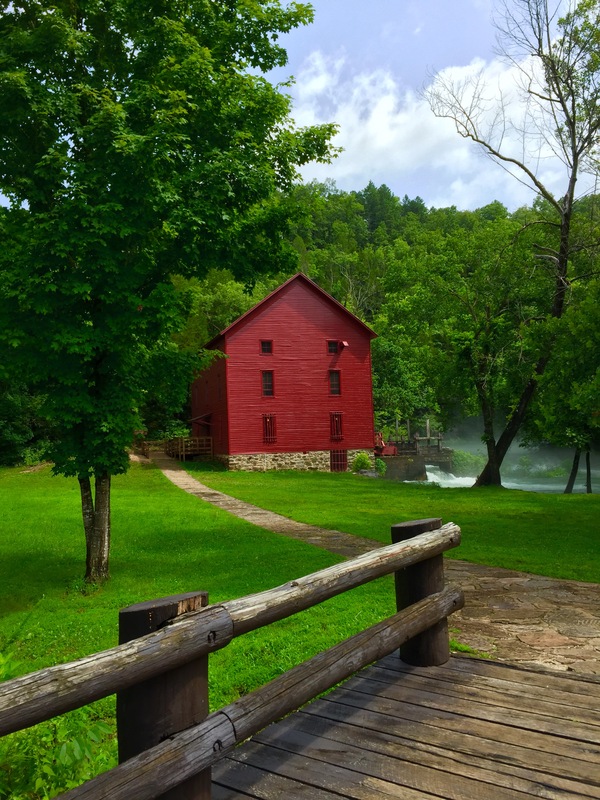 At the time the mill was built, it was considered high tech since it used a turbine and rollers to turn wheat and corn into meal. Farmers and their families used to come from surrounding communities, camp out, and wait for their corn to be processed. 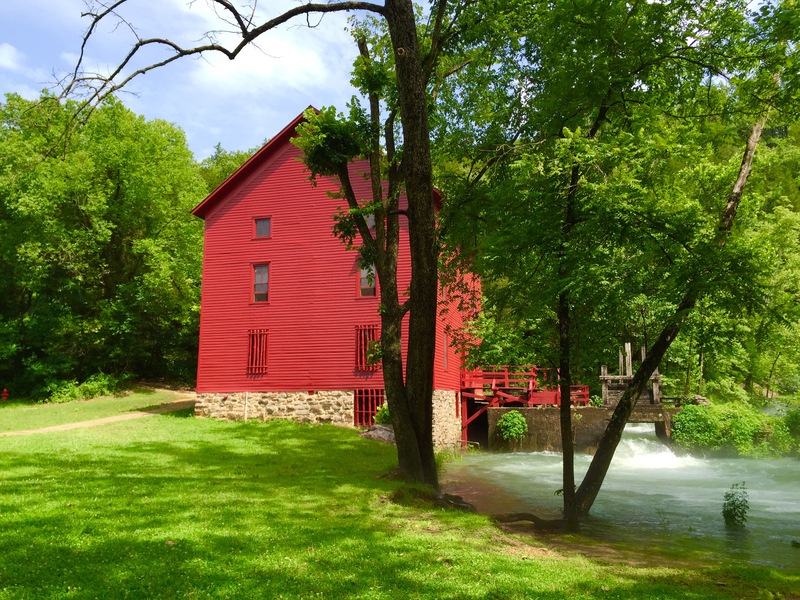 The mill sits next to Alley Spring on lush grounds. Alley is probably one of the most photographed places in the state. The first and second floor are are open to the public and contain exhibits and artifacts. There is a small deck off of the back door where you can gaze over the spring. 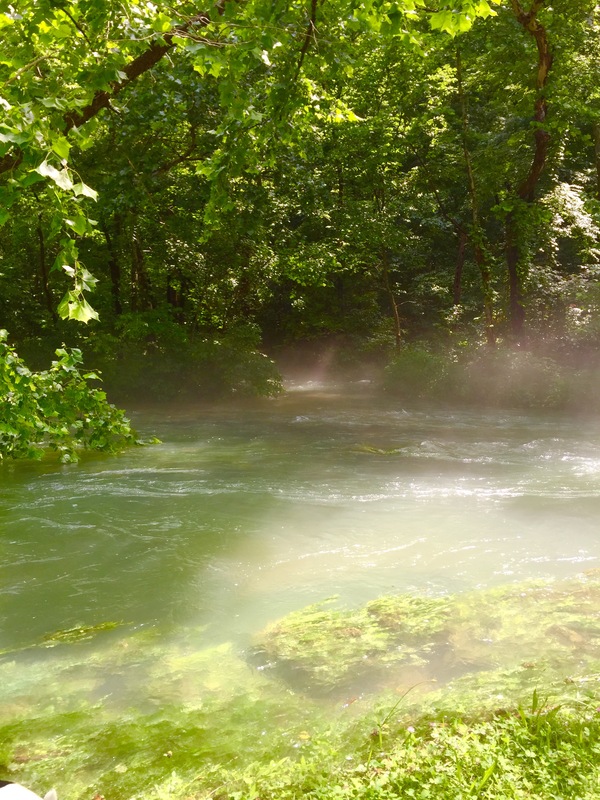 Alley Spring has a daily flow of 81 million gallons of water. 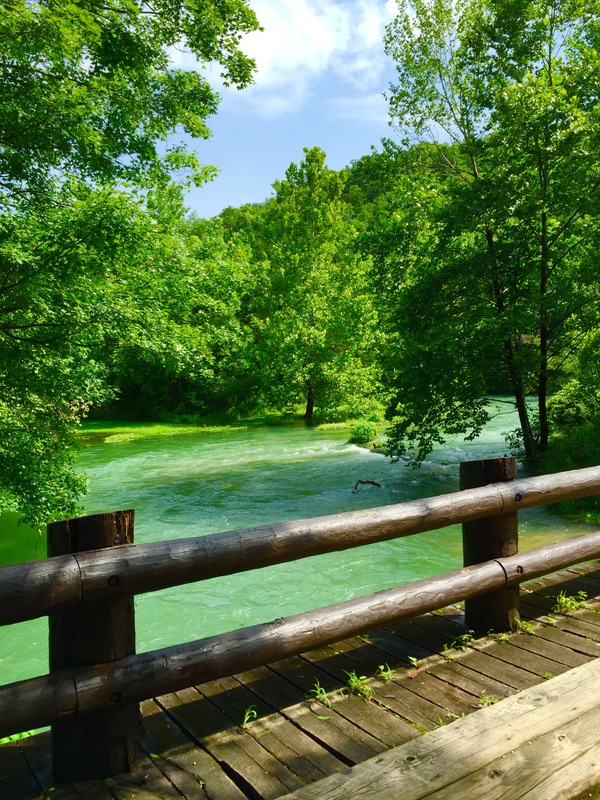 The spring is usually clear and bright blue, but while we were there, it was more cloudy and an aqua color due to the recent rain. There are two trails here. 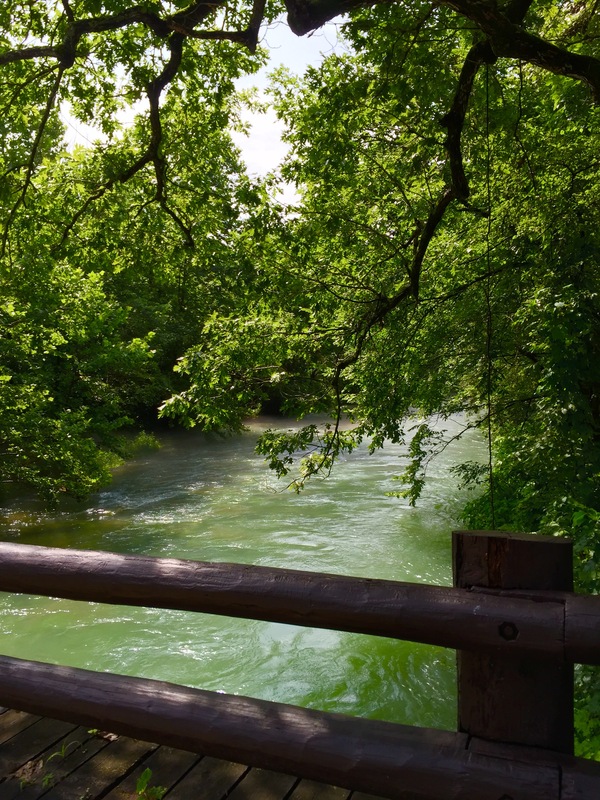 There is the Spring Branch trail which is about .3 miles long and begins behind the mill and ends down the spring channel near the bridge. 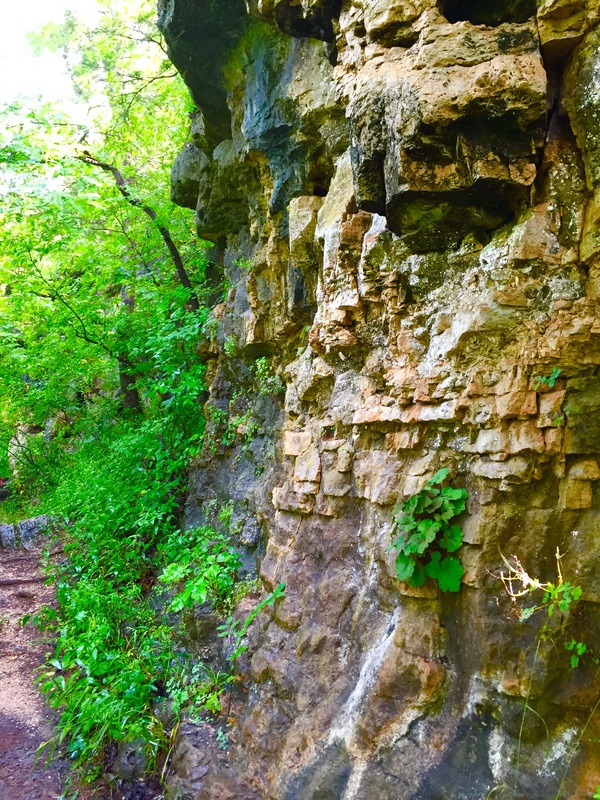 The trail was partially closed while we were there due to unsafe conditions, but we were able to hike a bit of it and see the neat rock features along the trail. 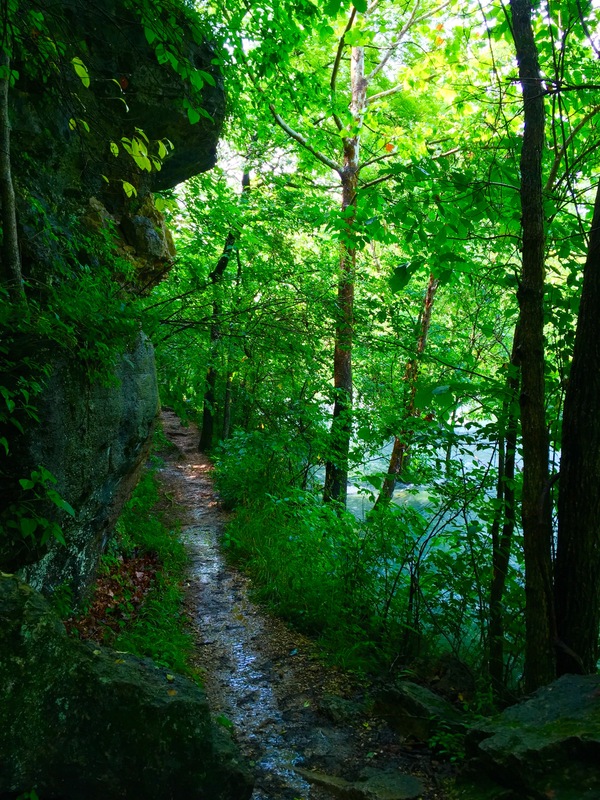 After finishing this trail, check out the spring branch that goes underneath the cute log bridge. Everything is just so bright and colorful. The color of the water is something that is hard to wrap your head around. From here, you can either go back to the parking lot or hike the Overlook Trail which is about 1.5 miles long back to the mill. The trail climbs uphill via a couple switchbacks. 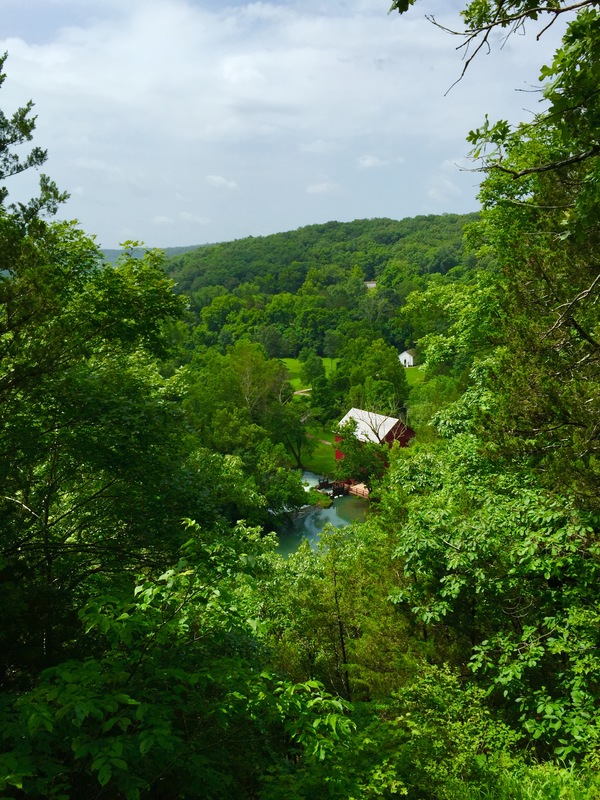 There is an overlook high above the spring where you can get a glimpse of the bright red mill and can even see the little school house. 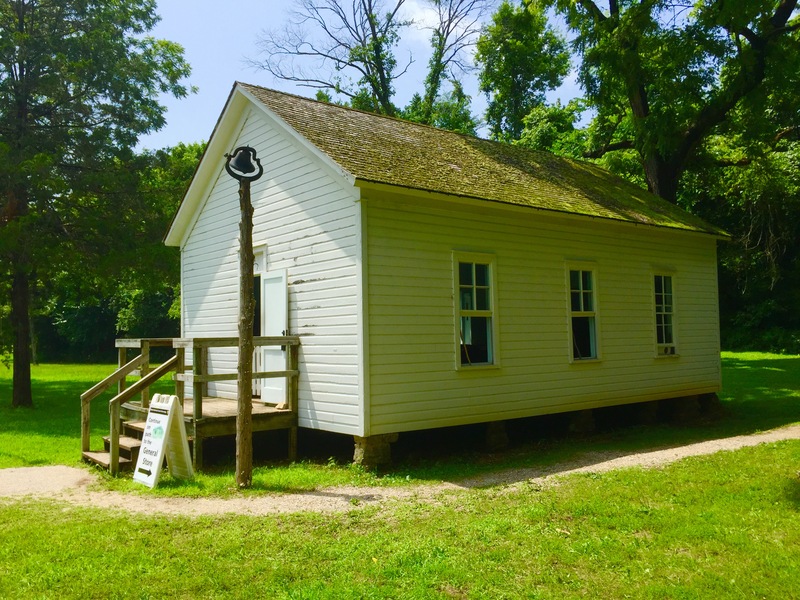 Also located on the grounds is the Story Creek one room school house. A short path leads to the school house where one look inside transports you back in time. After visiting Alley mill, we headed west on Highway 106 and not too far down the road, there is a pretty good overlook. There is a small pull off on the side of the road. 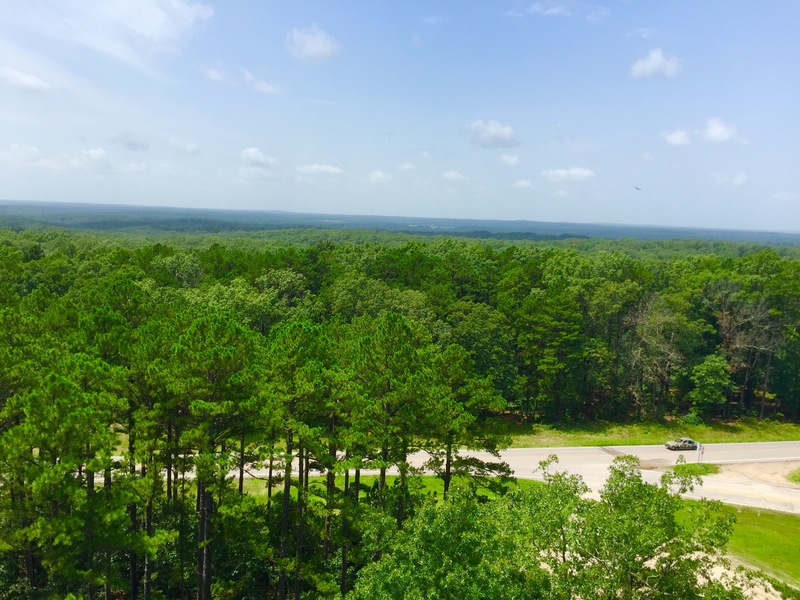 In the far distance, you can see the Jacks Fork River peeking through the trees. Note: If you decide to stand on the guard rail to take a picture (like I did 😉 ) make sure you have a friend hold your hand! From here, we stopped at the Flat Rock Fire Tower. The tower is at the corner of Highway 106 and Highway D. We climbed most of the way to the top…most of the way because the platforms get smaller and smaller the higher you go and someone is slightly scared of heights LOL. 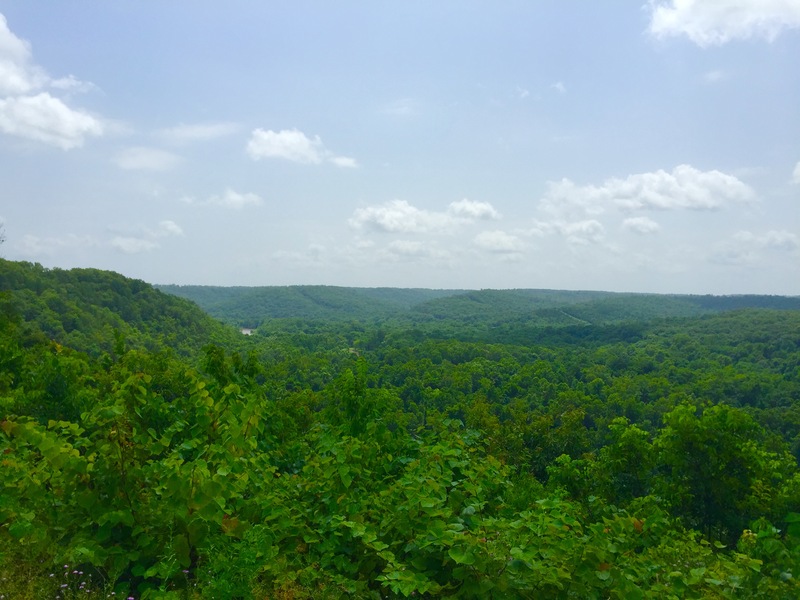 From the top you can get a 360 degree view of the rolling hills of the Missouri Ozarks. After checking out the tower, we tried to go a couple other places, but everything was closed due to the flooding. So we decided to head away from all of the flooding and went to stay with some family at the Lake of the Ozarks. 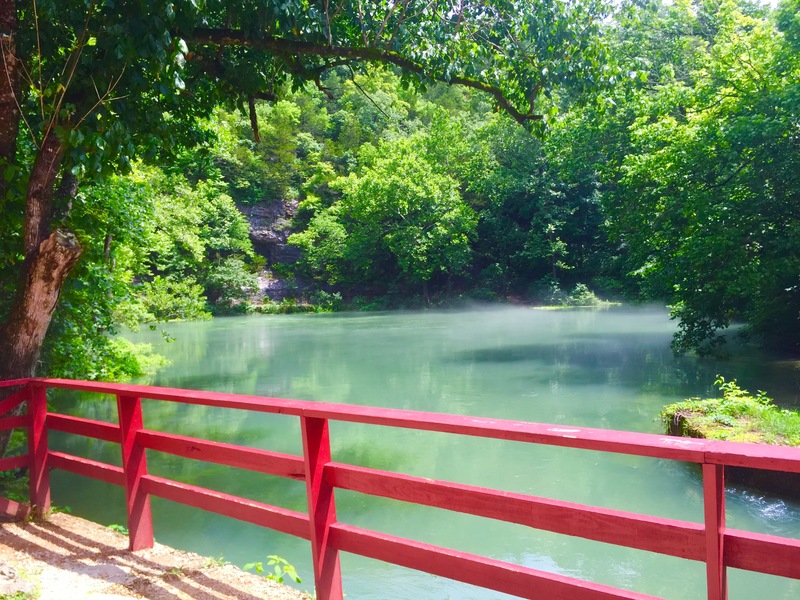 We did get to hike at Ha Ha Tonka State Park so check out my post here on that awesome state park! Overall, I wish we could have seen more, but Mother Nature just wasn’t cooperating. 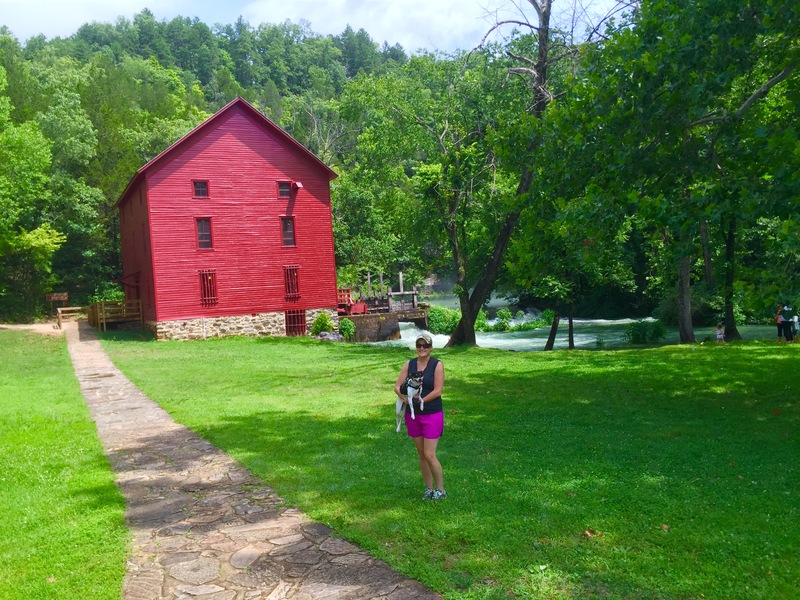 I am so glad we got to see Alley Mill and spring though and can’t wait to come back and see everything else this beautiful region has to offer! If you have any questions or comments, please leave them below! Also, if you would like to be notified every time I publish a new post, please follow my blog! 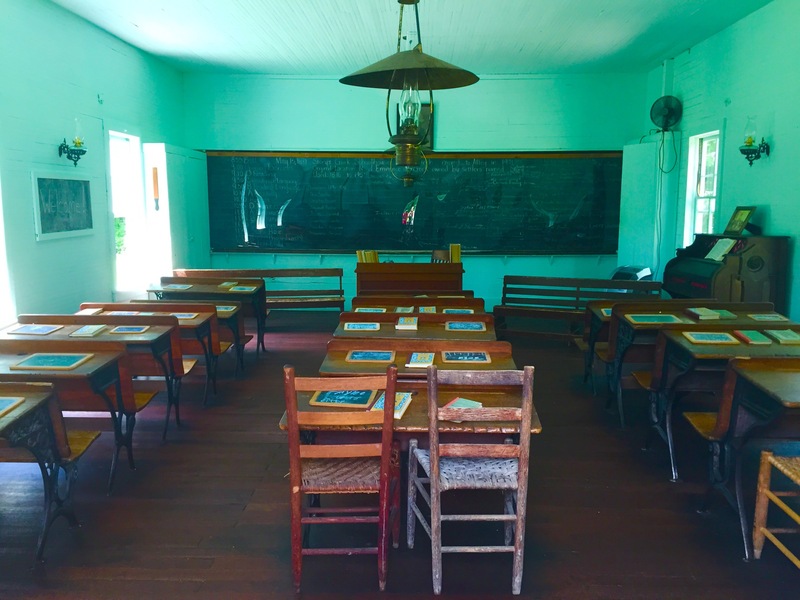 OH – forgot to mention the one room school house, sort of close to my heart! It was neat to see. Thanks Nan! I loved how they preserved the school house to what it looked like many years ago. It was neat to see the old books and desks! 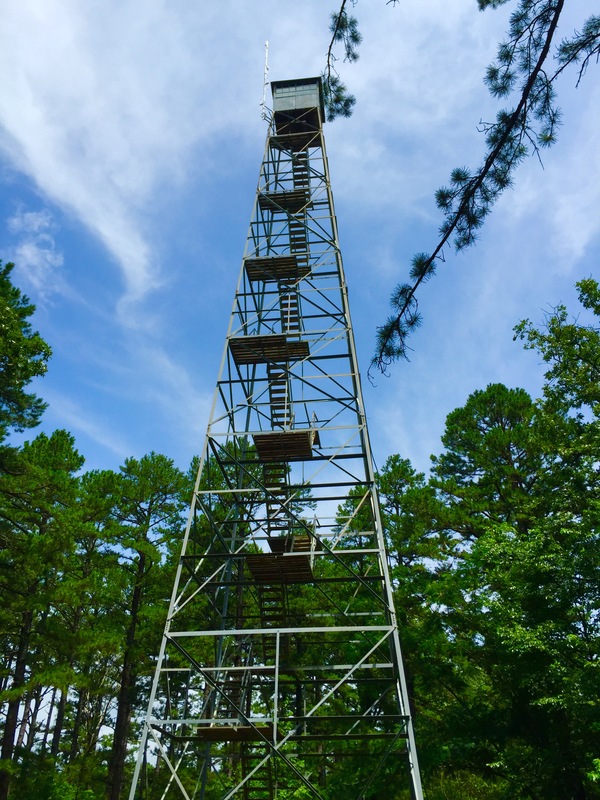 Well, I’d be scared to climb that fire tower too! 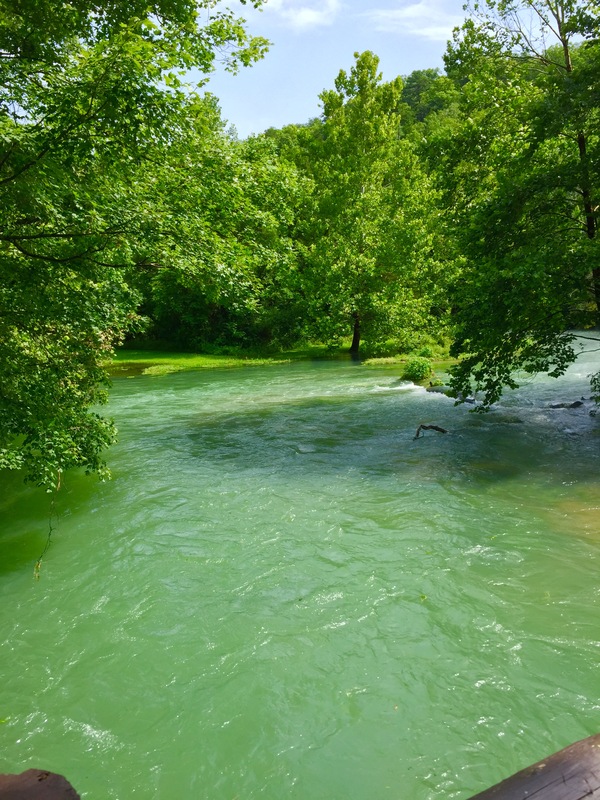 Beautiful photos of swirling waters! 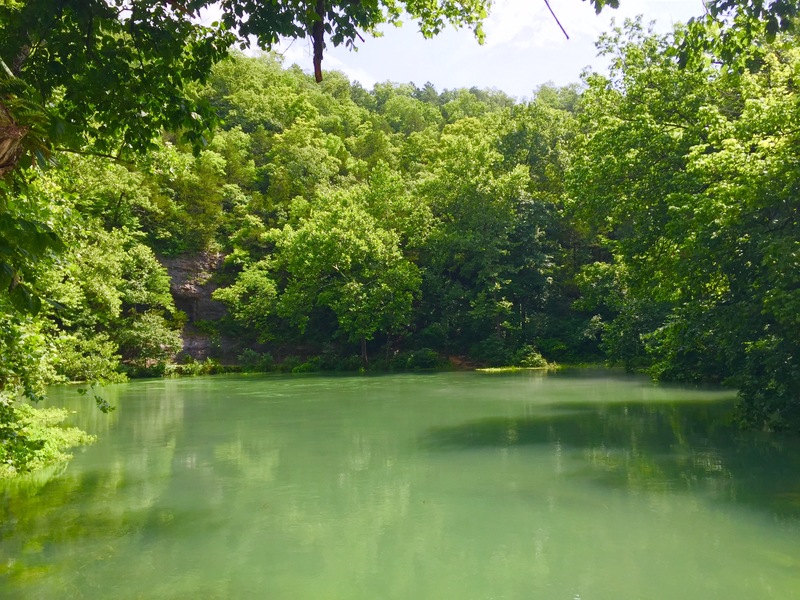 One of the prettiest areas, if not THE prettiest area, in Missouri! Great pictures! 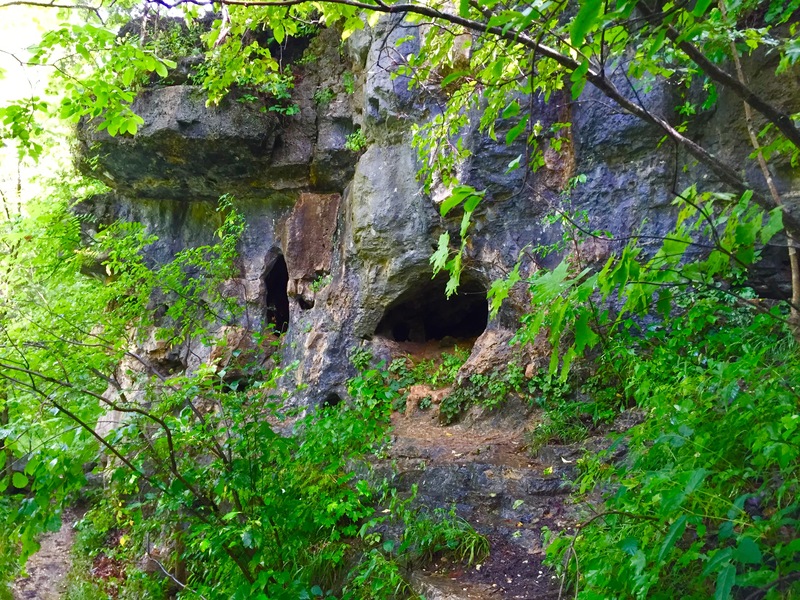 Just found your blog while planning my next hiking trip here in Indiana. While looking around I found this page. Love your shots. Here’s one that I took.